It is high time to officially announce the last band that we have signed for a 2012 release. Let us start with stating we are not much into Death Metal. We like some classic and even contemporary bands, but really very few, so obviously we are extremely picky as fans when it comes to this genre. And a Death Metal band has to completely blow us away to pique our interest as the label. 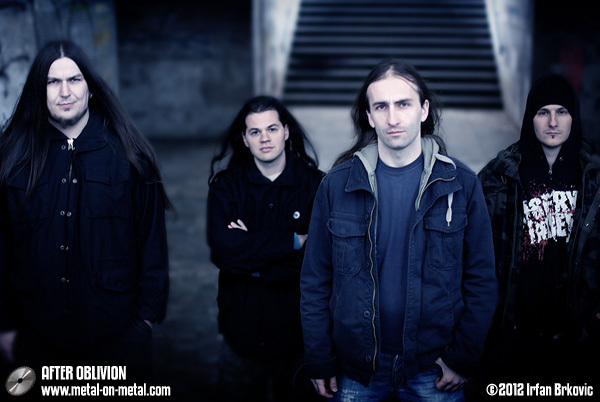 Such was the case with AFTER OBLIVION, a band from the still undiscovered country when it comes to Metal music: Bosnia and Herzegovina. The mastermind behind the band, guitarist, vocalist, composer and the sole member in the beginning, Adnan Hatić, formed it in 2007 on the ashes of his previous Death Metal band PATH BEYOND SERENITY (in which he had played since 1999). When Adnan contacted us, we listened to the three songs from their 2011 EP "Vultures", then listened again... and again. We could (and did) listen to them on a loop for hours... Why? 'Cause we love DEATH and AFTER OBLIVION is so uncannily similar to Chuck's band, in particular their '90s era (when you hear those vocals, you may think it's Chuck himself! ), we could only succumb to this new amazing band. They play technical (but not overly technical or progressive - on contrary, quite catchy, so accessible for a wider audience) and atmospheric Death Metal with some Thrash elements that should appeal not only to all fans of DEATH, but also PESTILENCE, ATHEIST, KREATOR, SACRIFICE, VEKTOR, GORGUTS, AGONIZE (another band with Adnan on vocals and guitars), CYNIC, CORONER and surely some other acts that we don't even know. Debut CD "Stamina" is coming in October! Meanwhile check AFTER OBLIVION page on our website (there's band's biography, info, links and photos) and watch the clip for "Septic Mind" from "Vultures" EP from YouTube.